The next thing to learn about is pressure applied to the edges. 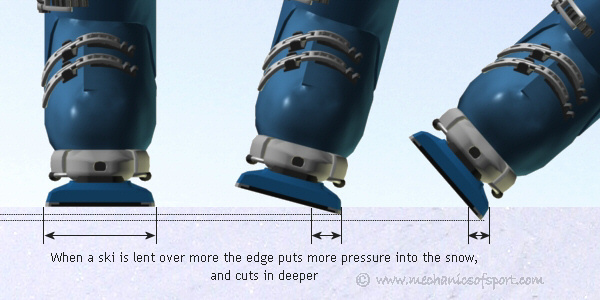 If the weight of you and your skis is spread over the entire base of the skis, that puts the least possible amount of pressure into the snow (pressure = force / area), as your weight is spread over the whole area of the base. If you take your weight off of the base of the skis and tilt the skis onto their edges though, your weight has a much smaller area to get transferred into the snow with, and puts more pressure into the snow. The added pressure makes the skis sink further into the snow, and the further they sink the more resistance they can provide. The diagram below shows how the area that the weight is transfered through decreases as the ski is leant over, and how the ski digs further into the snow the more it is leant over. Also the more the skis are leant over the more the base and edges can push sideways on the snow. This is because the force from the base and edge of the ski into the snow, acts at a right angle to their surface. The more the ski is leant over the larger the sideways component of this force becomes, so the more the ski will be able to push sideways on the snow. When we want to change direction or slow down, we need to push sideways on the snow, so the more the ski is leant over the quicker we we will be able to turn or slow down. This becomes very important when carving and stopping. 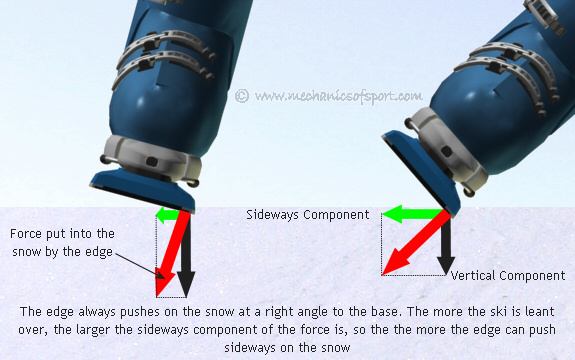 The diagram below shows how the components of the force from the base change as the ski is leant over more. Although leaning the ski over digs the edges in more and lets the ski push sideways more, if the ski is leant over too far the snow may not be strong enough to hold the edge in the snow, and the top layer of the snow can just get pushed sideways by the ski, making the ski lose all its grip. On to the Edge Effects section.